Some couples mark Valentine's Day with a candle lit dinner and extravagant gifts. And every once in a while, we do that too. But not this year. 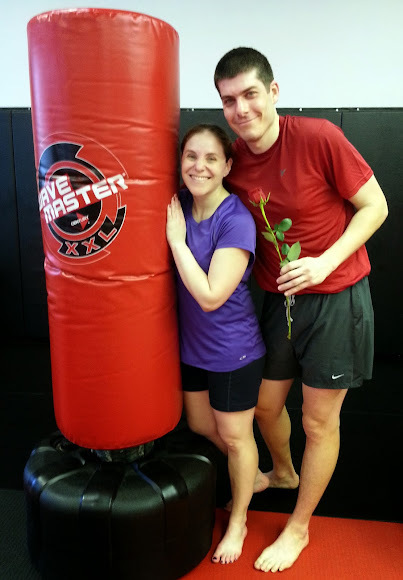 This year we continued the tradition we started last year of doing a couple's kickboxing class at Nova MMA. Nothing says you're my true love like slugging it out together, right? Last year, the class just about killed me. The first 20 minutes of it were great. Unfortunately, it was a 60 minute class. This year I was feeling a lot more confident. With a number of Krav Maga classes under my belt, I figured I could handle a single ladies kickboxing class. Again, I found that about 20 to 30 minutes in I was really enjoying the class. I was wailing on that bag, and while I'm sure I looked like an uncoordinated oaf, in my mind I was Bruce Lee. But, of course the class didn't stop after 30 minutes. While I managed to keep pounding away for the entire class, there was no denying that by the end I was mush. The class was cleverly setup so that Shira and I would alternate a technique. At one point Shira had to throw jab-crossses while I had to do burpees, and then vice versa. I knew I was cooked when doing the burpees was easier than the punches. Fun fact: after punching away for 45 minutes, the 14oz boxing gloves I was wearing felt like they weighed 20lbs each. Man, was I humbled. In the end I survived and am totally in awe of the fact that Shira does this sort of routine once or twice a week. I'm fairly certain I don't want to up it to twice a year. Happy V-Day babe; I've always said you're a knockout!